Predicting and managing the global carbon cycle requires understanding the ecosystem processes that control carbon uptake and storage. Although scientists generally think of carbon cycling in terms of the uptake and exchange between ecosystem plant and soil pools and the atmosphere, a new study of animals and the zoogeochemistry of the carbon cycle published in the journal Science shows animals also play a significant role by mediating carbon exchange between ecosystems and the atmosphere. 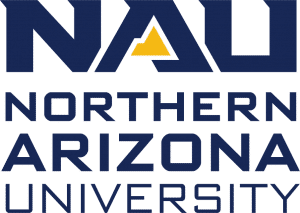 The study was done by an interdisciplinary team of scientists that Oswald Schmitz at Yale led and that includes Northern Arizona University professor Scott Goetz and assistant professor Chris Doughty. Because the impact of animal movement on the global carbon cycle needs to be better quantified and predicted, the scientists believe modern remote sensing technology can provide the data needed to characterize the many elements of animal life—such as habitats and biomass—that influence carbon and nutrient cycling. These data can be used to develop improved carbon cycle models that more accurately account for the biomass and feedback effects of animals on ecosystems. Scientists on the study challenge researchers to develop new ways of representing how the movement and abundances of animals may impact changes to the carbon cycle and how this will influence our future climate. “By testing and refining new spatial ecosystem models that consider animal feedbacks and integrating landscape scale experiments, cutting-edge remote sensing technology and statistical models and data layers representing the spatial biophysical conditions of landscapes, we can meet such an exciting challenge,” Doughty said. 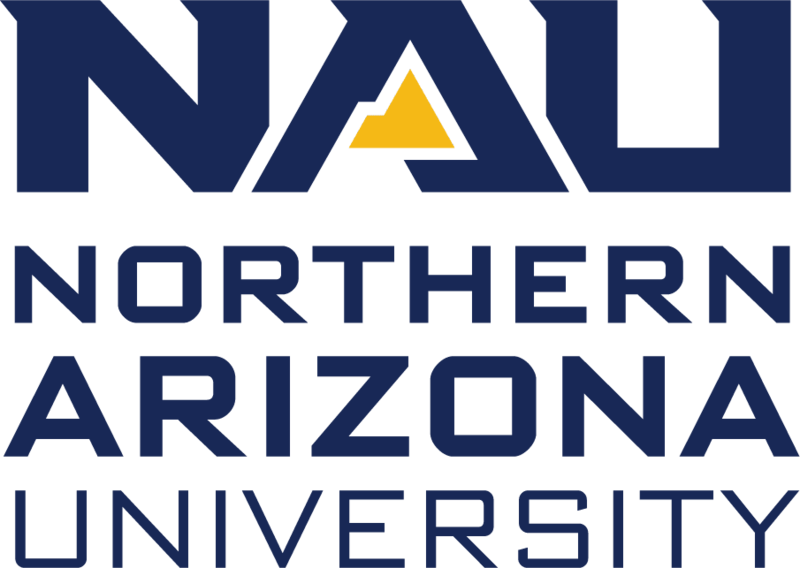 Goetz, of NAU’s School of Informatics, Computing, and Cyber Systems (SICCS), has conducted satellite remote sensing research for environmental science applications for more than 30 years, having both organized and served on numerous working groups for the Intergovernmental Panel on Climate Change, the United Nations programs on Reducing Emissions from Deforestation and Forest Degradation, the U.S. Global Change Research Program, the U.S. National Academy of Sciences, and NASA and National Science Foundation programs on arctic and carbon cycle science, climate change and terrestrial ecology. He is the science lead of NASA’s Arctic Boreal Vulnerability Experiment and deputy principal investigator of NASA’s Global Ecosystem Dynamics Investigation. Doughty’s research combines computational and field methods to better understand how these changes will affect ecosystems, with a specific focus on tropical forests. One major goal of his research is to determine how climate change will affect tropical forests and how this might in turn impact global climate. Doughty, also of SICCS, combines a large network of field plots from South America, Africa and Asia with remote sensing and models to better understand and predict forest growth patterns and carbon uptake. 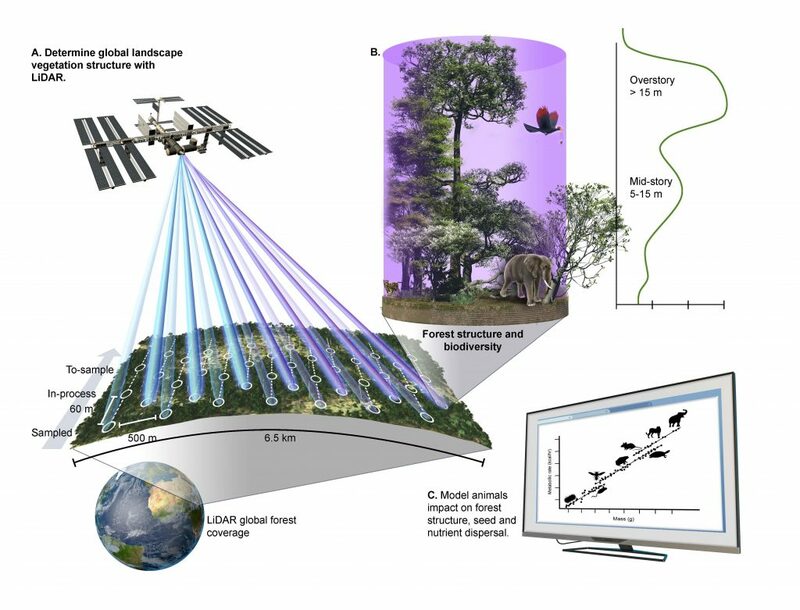 (A) Spaceborne remote sensing data generated from the GEDI LiDAR on the International Space Station can be used to predict global forest structure. (B) 3D forest structure within GEDI LiDAR footprints can be used to estimate habitat heterogeneity and utilization. (C) Ecosystem models informed with forest structure and habitat properties can be used to predict animal-driven changes in carbon and nutrient cycling.